I do not have peanut butter on my face. I swear. My finger, maybe. But not my face. Lex is in her favorite spot, serving as a footrest as Matt sprawls on the couch. When she’s ready, she’ll adjust her position, relocating behind the pillow beneath Matt’s head. Sometimes she’ll rest her chin in his hand, for as long as he’ll hold it. While Lexie’s recent ailments made me hesitate about going out of town, I know I’m leaving her in good hands. I’ll be gone almost four days, then Lex and Charlie will spend several days at Camp Bow Wow while Matt and I run away to a southern beach. It will be the first major vacation for Matt and me since we adopted Charlie. When I’m away on Vacation Part I, I’m pretty sure the kids (Matt included) will have a blast. I imagine they will have late night biscuit parties, and Charlie may even sneak up on the couch for a snuggle with Matt. Of course, he’ll never tell me if that happens. For Vacation Part II, we’ll have a front row seat watching the pups from afar via webcam. I even downloaded the Camp Bow Wow app so we can check on them through my iPhone. Ah, yes. I do love technology. Especially now that it connects me with my fur babies. 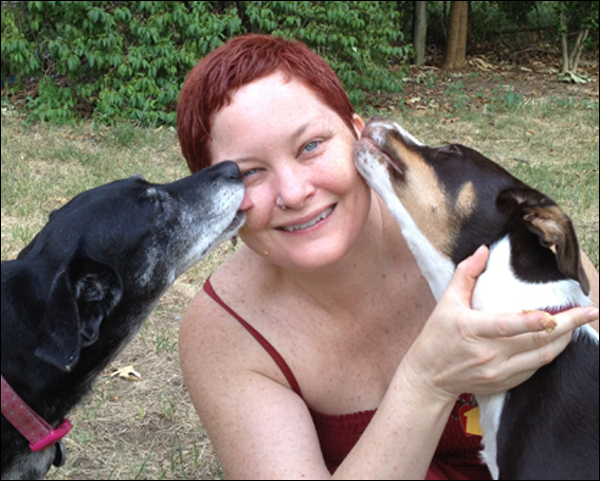 As I got ready for the first leg of my vacation, It occurred to me that I would like a photo of me and the dogs. Then it occurred to me that I would like to have them both kissing me in the photo. This was a problem, since it’s nearly impossible to get them to do anything in tandem. But then I got an idea. An awesome idea. I may or may not have spread creamy Jif peanut butter on my cheeks to inspire a canine lickfest. I’ll never tell. But this picture certainly is worth a thousand words. P.S. I just received notice that fellow bloggers Bella and Didi have honored Finding Furever with The Sunshine Award, for providing readers with a bit of sunshine and positivity. Super awesome! This entry was posted in Woof! and tagged adopt, boarding, Camp Bow Wow, dog, peanut butter, puppy, vacation by ourfureverfamily. Bookmark the permalink. Totally! Ha. I had so much fun getting that photo!